Raj Tents is a big brand in tent manufacturing company and they provide amazing tents to make your ceremony memorable, extraordinary and enduring. 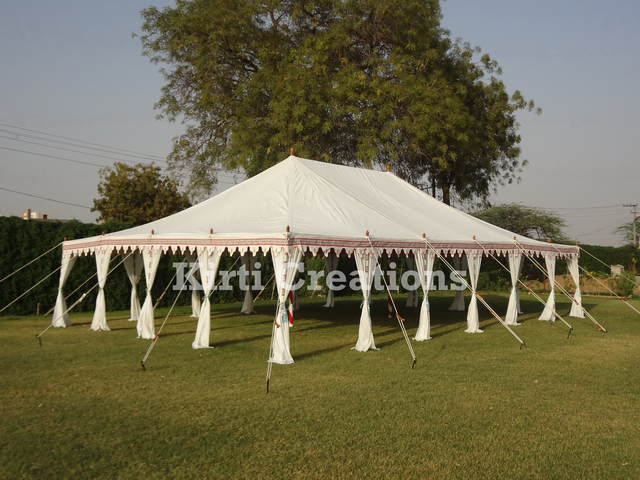 Basically Raj Tent for rent on affordable and cost-effective price in all over India. Exclusive Handmade Tent- Exclusive Handmade Tent is big in size but installing and uninstalling process of this tent is very simple but time consuming. This tent is created by intelligent and capable craftsmen in which craftsmen has knowledge how to develop attractive, impressive and comfortable tent. Exclusive Handmade Tent is accessible from all sides and supported by four side poles or pillars inn which tent all poles are decorated by white color of canvas. The upper part of this tent like a temple and white color of canvas is used. Royal Handmade Tent- Royal Handmade Tent is made by beautiful and smart colors of canvas and it is supported by designing poles. And this types of tent is openable from each sides and every sides have beautiful gate is used in this and designed with fascinating border. Royal Handmade Tent is luxurious and spacious types tent which is used for huge gathering parties and celebrating every moments of your life. It is the place of peace and comfort. Generally red color of canvas is used in this tent and easy to install every plain surface areas. This is available in different sizes and design as per demand of clients. Raj Tent suppliers serve very useful tents on economical price. 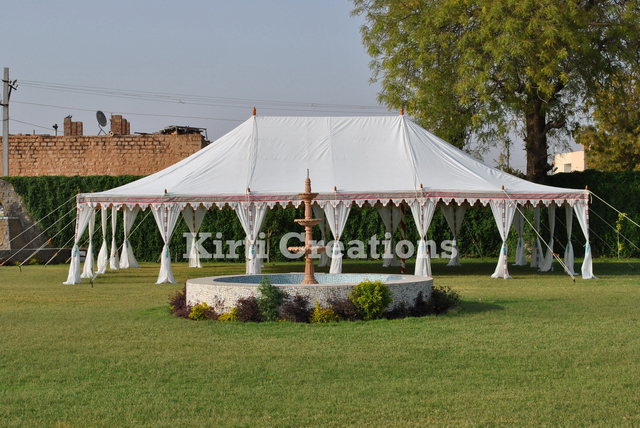 Raj Tents is normally used for any types of occasions. The main goal of Raj Tents is gives high level and smart facilities on affordable costs and all product of this tent is very pretty and comfortable. Raj Tents is a big seller of tents in over the world, our products range is wide and suitable for all variety of parties and function. Our products is tested after that we are supply tents at cost-effective rates so that everyone can afford this tents and makes memorable party. 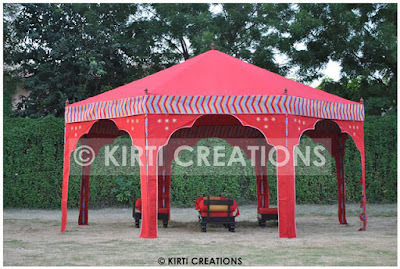 Exotic Handmade Tent:- We present Exotic Handmade Tent in hut shape with medium size, fancy and eye catching canvas makes this tent wonderful and best for stylish parties or small parties. It is well known for fabulous design and style. Outdoor Handmade Tent:- The great decoration of Outdoor Handmade Tent add beauty of the tent, round in shape but interior and exterior canvas is different and pitching process is outstanding. Best for outdoor parties or lunch and dinner with natural beauty. A wonderful and sturdy celebration Raj Tents is best for outdoor occasion, mostly parties is organize on ground or lawn. Raj Tents is host a parties or function in a very beautiful way and really you get feel great. 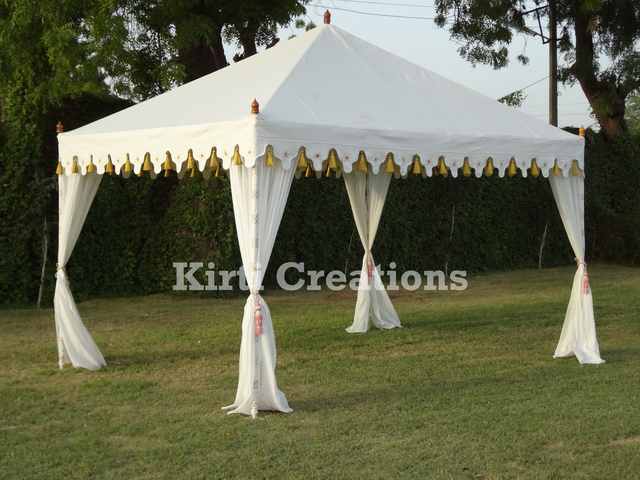 In market many variety of Raj Tents is available, you have option for choosing a right tent with budget price for our function. If you want to make organize parties and celebrations are really special important role plays in your life, then you have one best opportunity for choosing Raj Tents. Raj Tents manufacturing company serve many different- different color and shapes of tents. Impressive Handmade Tent:- This tent is present itself in white color of canvas with beautiful border, main thing is Impressive Handmade Tent is pitched on garden with big size. It is easy to tolerate rough weather condition. Magnificent Handmade Tent:- We present a Magnificent Handmade Tent on very cost-effective price, it is more demanded for size, decorate with white color of canvas with gorgeous amenities. Over all it is best tent for huge and cultural events. 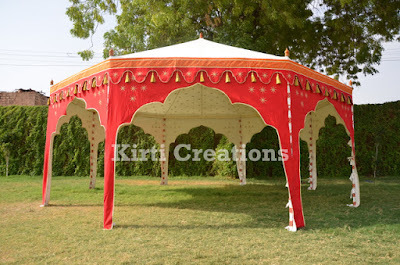 Raj Tents is more demandable because of its uncountable beauty and decoration. Raj Tents is arrange everything under the tents and create beautiful environment around the tent. 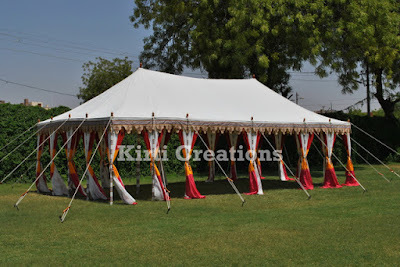 Raj Tents is one of the best option for wedding, marriage ceremony especially if invest tight budget. 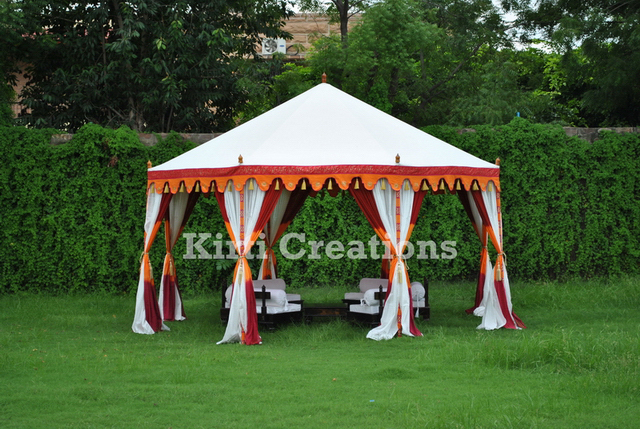 Raj Tents is a part of kirti Creations. Raj Tents have well experienced and optimistic workers they works hard for our clients. This tent gives opportunity to enjoying any occasion and events like birthday party, marriage party, kiddy party, anniversary party etc. The service of Raj Tents is very fast because they have time optimistic workers. Wonderful Handmade Tent:- Wonderful Handmade Tent is a Luxury Tent. It is made by very experienced and professional artist. These type of tent is the best option for organizing the occasion. If you have big quantity of gathering then you have to choose this tent. Wonderful Handmade Tent is available in all shape and sizes. 100% Fabric used in Wonderful Handmade Tent. It is available in size of (4m X 6m, 6m X 10m, 8m X 12m, 10m X 15m and 12m X 18m). Lighting System of these tents are gorgeous and attractive. The border of this tent is very stunning and delightful. 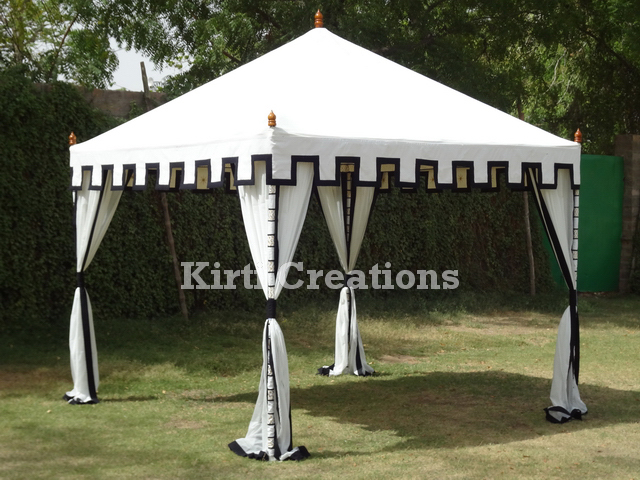 Aesthetic Handmade Tent:- Aesthetic is the meaning of Saundarya. 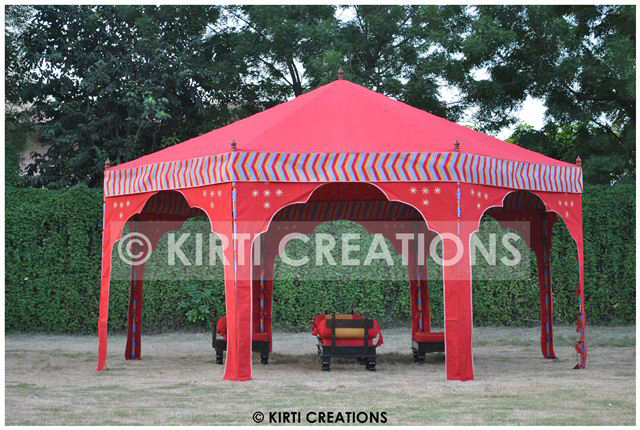 Aesthetic Handmade Tent is a types of Indian Tent. These type of tents are describing the nature. If you choose the Aesthetic Handmade Tent then you have lots of fun because it created, managed and maintained by experienced workers and professional artist and good fabrics, artificial flowers, artificial trees and many more things used in this tent. It is made by natural fabric. The size of this tent is (4m diameter, 5m diameter and 6m diameter). The main features of this Tent is beautifully, attractive and charming look. Our Tents is available for the clients in different designs, styles, colors, sizes and The other specifications of Raj Tents is very smart and attractive and we try to provide tent to the customers in low cost. The Raj Tents use a very big size of lilt in tents so tents are looking very beautiful and the increasing the charm of tents. Raj Tents provide many more types of tents to our customers Garden Tent, Wedding Tent, Party Tent, Indian Tent, Homemade Tent, Event Tent, Exclusive Tent, Mughal Tent is the types of Luxury Tent. Traditional Tent, Resort Tent and Outdoor Tent are the main part of Raj Tents.